Batman is nothing without his villains. If he's not fighting costumed supervillainy, Bruce Wayne is just a rich man who beats up poor criminals who were forced into a life of crime by the crippled economy of Gotham. With supervillains, Batman is a hero. Without them, Bruce Wayne is just a privileged thug. Bruce Wayne's estate is worth billions, and as the Wayne family butler, Alfred has unique and unfettered access to these funds. He is the one man that Bruce trusts without reproach, and the one man who knows what Bruce needs and of his fragile mental state. In Bruce, Alfred stills see that small frightened boy, and so it is obvious he would want the best for his young charge. 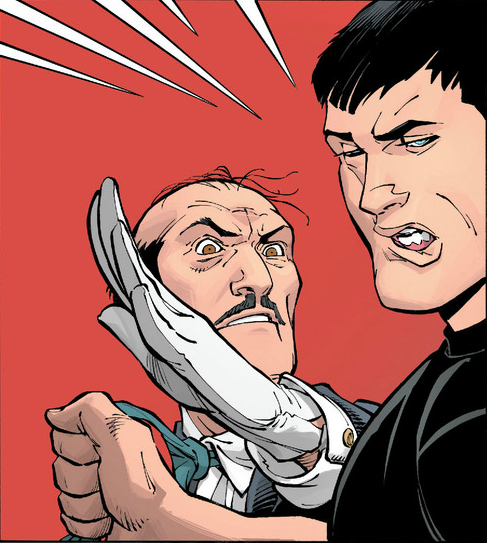 By financing the high-tech weaponry and henchmen armies of Batman's rogues gallery, Alfred ensures that Bruce is fighting the good fight, and gives him a true purpose in life. Batman's files gives Alfred direct links to the underworld and so he knows exactly where to inject cash. Who else would loan penniless criminals just out of jail the million dollars needed to build a death ray? Not a bank! Not a rival! No, only Alfred fits the bill. It is in his best interest to see Batman constantly fighting super villains. Remember, Alfred is not just a butler. He is a highly skilled individual who is ex-RAF and ex-British Secret Service. How many men has Alfred had to kill for Queen and country? He also has experience on the dark side of the law as the villainous Outsider. Could his mastery of Gotham's criminal underworld really be for the good of Bruce Wayne, or could the Outsider still be active and Alfred was not turned back to the side of good by the magic science radiation as he had claimed?